A gas turbine is a machine which harnesses the energy contained within a fluid - either kinetic energy of motion or the potential energy of a gas under pressure - to generate rotary motion. In the case of a gas turbine this fluid is usually, though not necessarily, air. The earliest man-made device for harnessing the energy in moving air was the windmill, described by Hero of Alexandria in the first century ad. Figure 4.1 Block diagram of a gas turbine for power generation of the second millennium AD. As described in the seventeenth century by John Wilkins, later Bishop of Chester, the smokejack used hot air rising through a chimney to move windmill vanes and drive a shaft which could be used to rotate a spit for roasting meat. This principle of harnessing moving air to create rotary motion for driving machinery was developed further during the industrial revolution. following this principle, the nineteenth century saw a number of predecessors to the gas turbine. These used some form of compressor to generate a flow of pressurised air which was fed into a turbine. In these machines the compressor was usually separate from the turbine. The direct ancestor of the modern gas turbine was first outlined in a patent granted to German engineer F. Stolze in 1872. In Stolze's design, as in that of all modern gas turbines, an axial compressor was used to generate a flow of pressurised air. This air was then mixed with fuel and ignited, creating a flow of hot, high-pressure gas which was fed into a turbine. Crucially the compressor and the turbine were mounted on the same shaft. Whereas a gas turbine supplied with pressurised gas from a separate compressor must inevitably rotate provided it has been designed correctly, the arrangement patented by Stolze need not necessarily do so. 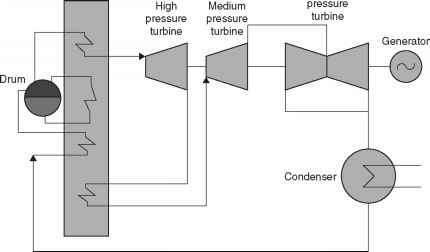 This is because the energy to operate the compressor which provides the pressurised air to drive the turbine is produced by the turbine itself. Thus unless the turbine can generate more work than is required to turn the compressor - the energy for this being provided by the combustion of fuel which produces the hot gas flow to drive the turbine - the machine will not function. This, in turn demands extremely efficient compressors and turbines. Both need to operate at an efficiency of around 80%. In addition the turbine must be able to accommodate very hot inlet gases in order to derive sufficient energy from the expanding gas flow. 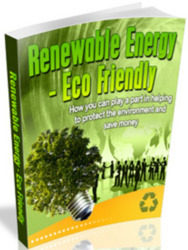 Only if these conditions are met will the turbine operate in a continuous fashion. The turbine system described by Stolze, although envisaging virtually all the features of a modern gas turbine, was not capable of sustained operation because the machinery to achieve it had not yet been developed. The first machine, which could run in a sustained fashion, was built in Paris in 1903. This, though, did not have a rotary compressor on the same axis as the turbine. That honour fell to a machine built by Aegidus Elling in Norway and operated later in 1903. In Elling's machine the inlet gas temperature was 400°C. Development of the gas turbine continued through the early years of the twentieth century, the aim remaining to generate either compressed air, rotary motion or both for industrial use. Then, during the 1930s, the potential of the gas turbine to provide the motive force to flight was recognised and aircraft with jet engines based on the gas turbine were developed in Germany, in Great Britain and in the USA. These led, in turn, to the modern aircraft engines that power the world's airline fleets. During the late 1970s and early 1980s gas turbines began to find a limited application in power generation because of their ability to start up rapidly. This made them valuable as reserve capacity, brought into service only when grid demand came close to available capacity. These units were based on the aeroengines from which they were derived but by the late 1980s larger, heavy gas turbines were under development. These were intended solely for power generation. Which came first Gas Turbines for flight or for energy generation?